Flabellina nobilis is one of the most common nudibranchs on the Norwegian west coast. The universe of nudibranchs is a strange microcosmos – and if you get hooked, you’ll soon find yourself addicted to looking for new and ever stranger species. For most people it takes several years of scuba diving before they see their first nudibranch, but as soon as you discover these delicate little creatures you’ll start seeing them on almost every dive. The Eubranchus species are describes as having «balloon-like fringes» - clearly seen in this colorful specimen. Cadlina laevis is relatively seldom seen. It lives deeper than most other nudibranchs, feeding on sponges. It produces acid in the yellow glands along the edge to defend itself from predators. Nudibranchs come in two categories – those that are hard to find, and those which are impossible to overlook, at least seen from a divers point of view. 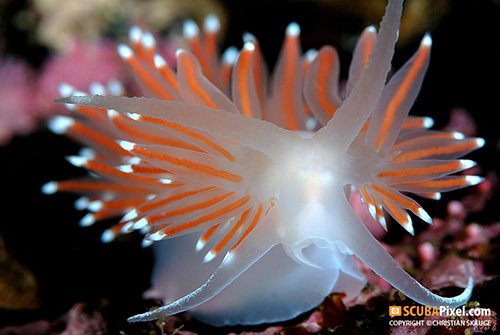 They are described scientifically as the nudibranchia, literally meaning ”naked gill”. As the name implies, they don’t have a house on their backs. Nudibranchs are generally divided into four main groups. The west coast of Norway is an exceptionally good place to go looking for nudibranchs. The main hotspot is the house reef of Gulen Dive Resort just north of Bergen, where 63 of Norway’s around 90 species have been found in recent years. The resort hosts an annual Nudibranch Safari at the end of March, which is high season for nudibranchs in Norway. 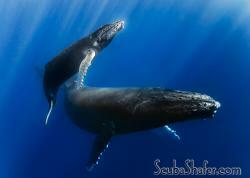 Diving the house reef only, divers with a keen eye can easily spot over 20 different species on a single dive. Sometimes the bottom is almost completely covered with colorful slugs, and visitors from all over Europe are impressed both by the great variety of species and the sheer number of nudibranchs that can be seen. 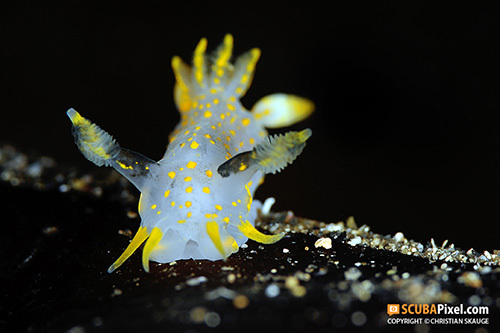 On the Nudibranch Safari described below, experts are on hand to teach the participants more about nudibranch biology, behavior, feeding habits and identification. 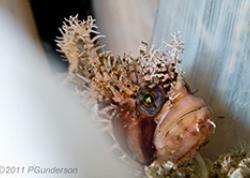 In March 2014 Gulen Dive Resort offers four consecutive events: Two regular Nudibranch Safaris hosted by Dr. Alex Mustard/Bernard Picton and Bernard Picton/Jussi Evertsen, a Nudibranch Symposium targeting scientists and nudibranch experts, and a special Russian Nudibranch Safari hosted by the Dr. Alexander Martynov and Dr. Tatiana Korshunov. 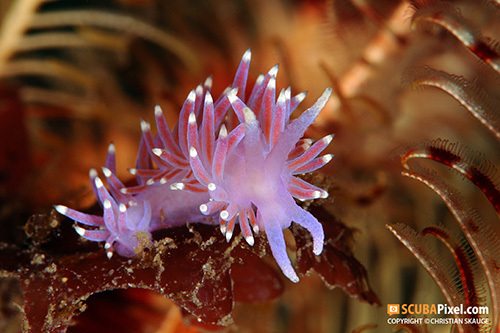 Flabellina pedata is very easy to identify - it is the only purple nudibranch found in Norway. 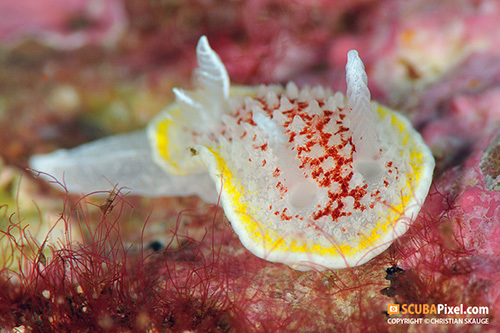 The beautiful Favorinus blianus hides a sinister secret: It feeds on the eggs of other nudibranchs! The nudibranchs have rather special preferences when it comes to reproduction since they are hemaphrodites. This means they have both male and female reproductory organs. The upside to this ingenious reproduction scheme is the possibility for all mature individuals to reproduce, and they can do so with any other nudibranch of the same species which they encounter. If you spot two nudibranchs laying side-by-side in a cheeky 69-position, they are most certainly mating, as their reproductive organs are positioned on their right side. 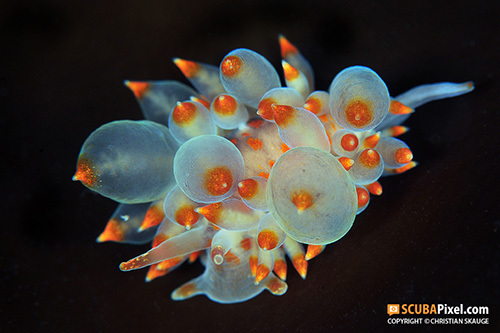 Many of the nudibranch species have their own, distinctive way of arranging their eggs. Some string them out in beautiful, parallel lines or elaborate spirals, while others prefer to lay them out in a flower-like arrangement or a ribboned cluster. Quite often it is possible to tell which species the eggs belong to just by looking at the pattern in which the are laid. The eggs are also often laid directly on the main food source, which also gives an indication to what species it is. When the eggs hatch small pelagic larvae are released, which settle on the bottom after a few days. During this stage several species actually have a minute, snail-like house on their back - but this soon disappears. Thanks to currents in the water the nudibranchs are able to spread their offspring over vast distances. The larvae will only settle if the right kind of food is present, enabling them to grow to adulthood and reproduce over again. Nudibranchs that feed on animals available year-round (for instance, dead men’s fingers coral or anemones) often live for over one year. They can be spotted almost anytime, while other nudibranchs that rely on more seasonal food can only be seen during short periods of time. Polycera quadrilineata is very common, and mostly found on the kelp fronds where it feeds on tiny bryozoans. Hero formosa is considered to be very rare in Norway, and is only known from relatively few locations. On the house reef of Gulen Dive Resort it usually turns up in good numbers at the Nudibranch Safari. 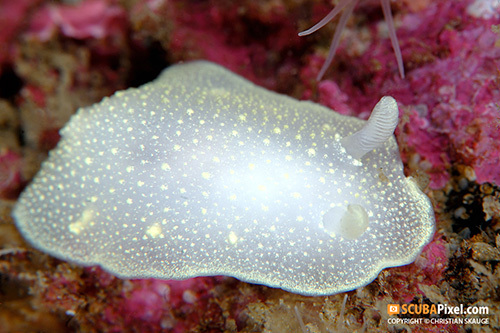 Nudibranchs are carnivores and feed on almost all kinds of other animals. If you want to find a particular species, it helps to know what it feeds on. Many prefer hydroids, while others feed on bryozoans, dead men’s fingers soft coral, sponges, anemones, barnacles and even eggs from other nudibranchs. If you find an area with hard bottom, it will be a good place to start looking, although one might also find nudibranchs on sand or soft substrate. The two white-and-yellow species found in Norwegian waters, Limacia clavigera and Polycera quadrilineata, along with several other species prefer staying on kelp, where they graze on bryozoans. 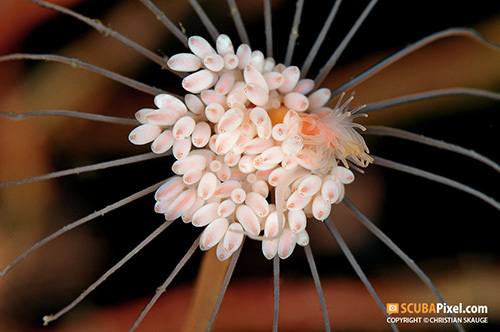 It is no coincidence that many nudibranchs prefer a diet consisting of cnidarians like hydroids and anemones. 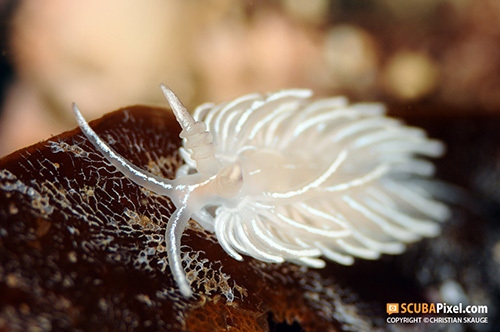 The fringed nudibranchs, the so-called aeolids, have the ability to channel the stinging cells of their prey into special chambers in their fringes (called cerata) on their backs - not only eating the hydroid but also stealing their protective sting. If a predator tries to eat the nudibranch, it will burn itself in the mouth and will spit the nudibranch right back out again. 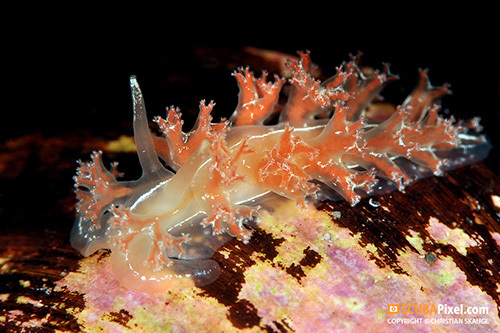 The color of the cerata or fringes is actually made up of the content of the intestines of the nudibranch as they branch out into the fringes. The typical red color seen on many nudibranchs comes from eating hydroids, which in their turn have been eating little crustaceans, absorbing the red color from their shells. Other nudibranchs which are feeding on sponges, are able to use toxic or bad-tasting compounds from their food for their own defense. Hydroids are the main food of most aeolid nudibranchs, for instance the Flabellina, Facelina and Eubranchus species - but the Doto also favour this food. Very small and extremely beautiful. The Diaphorodoris luteocincta cannot be mistaken for any other nudibranch species in Norway. There are a lot of books and online resources available if you want to learn more about nudibranchs. But the best (and most fun) way is to join the Nudibranch Safari. Gulen Dive Resort in Norway has been running these events for five years, and the end of March is the best time of the year to see lots of nudibranchs. 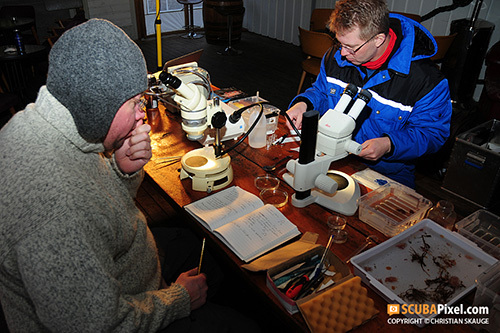 Norwegian nudibranch experts Jussi Evertsen and Torkild Bakken working on the collected material, trying to sort out the different species.